Spanish choosing rhymes add language to a classroom or household. Choosing rhymes are used to start games, but kids can also recite them for fun. In Spanish, these rhymes are called retahilas. Reciting retahilas, children learn vocabulary, rhythm and sounds of Spanish. There are many different choosing rhymes and many variations of each one. You’ll find a download of popular Spanish choosing rhymes below. Be sure to check our complete collection of traditional Spanish games for kids. With everything from playground games to board games, they are our favorite Spanish games for language learners. Spanish choosing rhymes can be incorporated into classroom or household routines. They can be recited in pairs or small groups to make a choice. Rhymes can also be recited as a large group to select which game to play or song to sing. In either case, using a choosing rhyme adds an element of chance and fun. 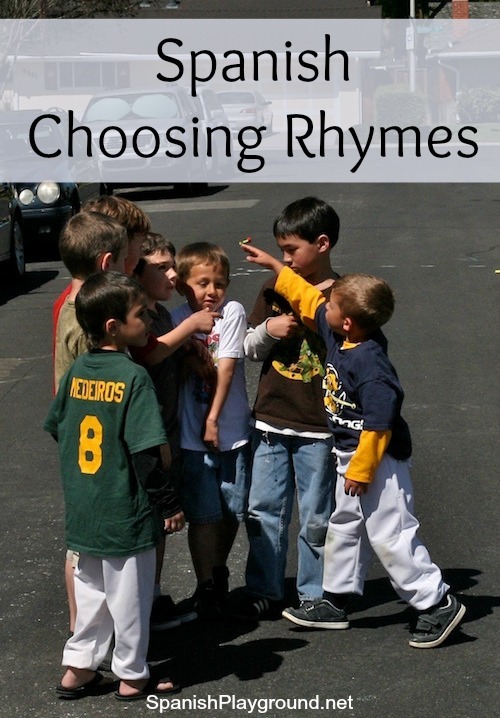 Try using choosing rhymes when there is a choice or decision to be made. De tin marín, is one of the most common of the many popular Spanish choosing rhymes. My children learned it when they were little and used it with their friends in Mexico. The last line is about hitting, so it is not something that I would choose to teach children, so it is not on the printable. However, I understand that De tin marín is a traditional rhyme, so I have included it below. There are many other Spanish choosing rhymes that teach common vocabulary and work well with language learners. There are hundreds of traditional Spanish choosing rhymes. Search retahilas on YouTube to listen the rhymes below and many others. You can download a printable version of these Spanish choosing rhymes here. With the first two rhymes, count the age. The last person is out. The next two rhymes, Manzanita del Perú and En un café, are traditional counting-out rhymes to start games. For both, kids usually count to ten, but sometimes they stop at three, since tres and diez rhyme. I have also seen Manzanita del Perú used as a jump rope rhyme. ¡Y 1, y 2, y 3! In this version, a cat (un gato) is being raffled off, and kids count to four (cuatro). y desde ahora soy el jefe. puso un huevo en la cocina. puso un pan de bizcocho. As I mentioned, I include De tin marín here because it is traditional. I do not teach it in my classes, but it is undoubtedly the most common Spanish choosing rhyme in Latin America. The first two lines are nonsense words. Pégale, pégale, que ella fue.